A typical street fair scene. What a nuisance! If you’re anything like me, you doubtless think that most of the street fairs that crop up hither and thither are a confounded nuisance. For one thing, they clog the streets with ambling, gawping pedestrians, going too damn slow, ogling the usual line up of cheap sunglasses vendors and sock sellers. 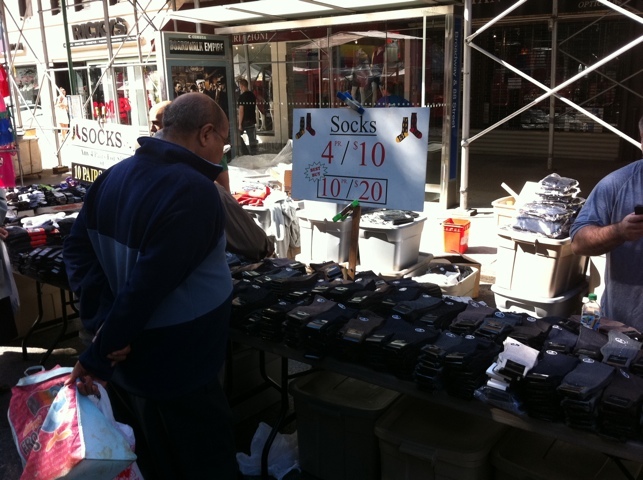 Socks, cheap sunglasses, kitsch... . The usual suspects. And that is another thing: There’s precious little variety to these fairs, generally. It’s always the same vendors with very little local representation. It seems like it is always the same mobile mall, transplanting itself about town. They also sell such random stuff. I’ve always wondered who buys the dental equipment I see on sale there. To me, street fairs make sense when they have a theme (i.e. 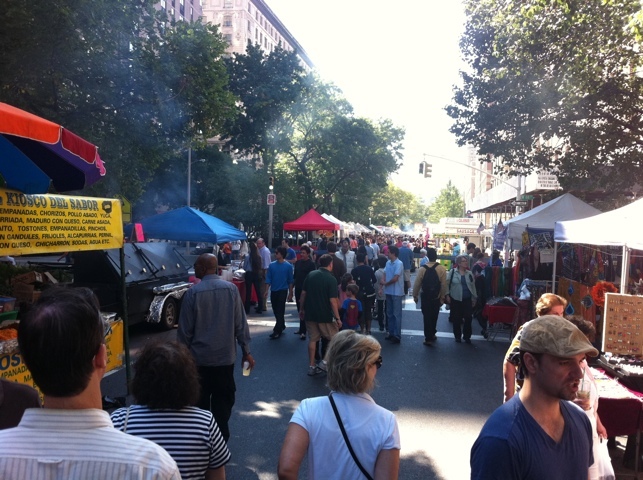 the 9th Avenue Food Fair, or the Bastille Day celebration on the East Side). Otherwise, it’s the same 10 or 20 vendors just repeating endlessly at these things. Used CDs, cheap jewelry, rugs and so forth. Indeed, it seems most street fairs are produced by just a few organizing entities: Mort and Ray productions, or Mardi Gras Festival productions. I’m not sure if that’s why there are always the same vendors, or why they don’t seem to be as local as they used to be when I was a kid, but who knows. 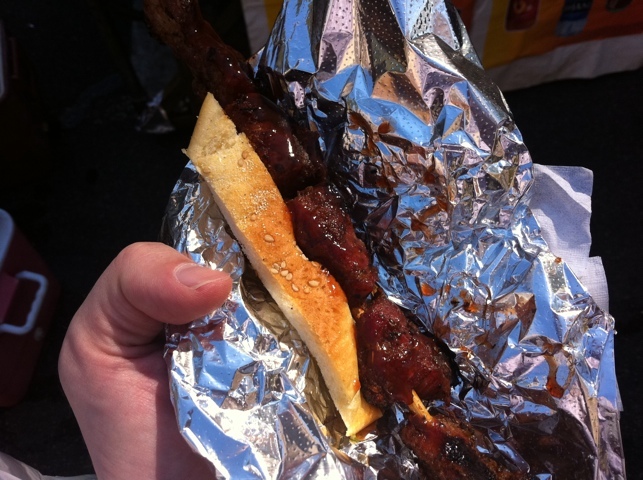 Meat on a stick... mmmm. 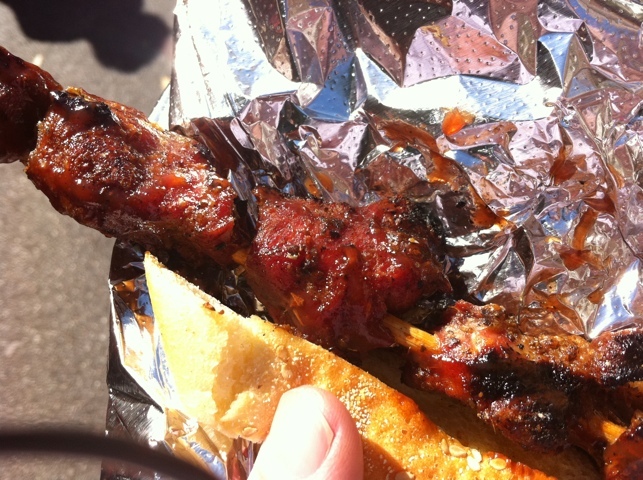 There is one good thing about them, though: The inexplicably delicious meat on a stick. It’s wonderful, when it doesn’t kill you. 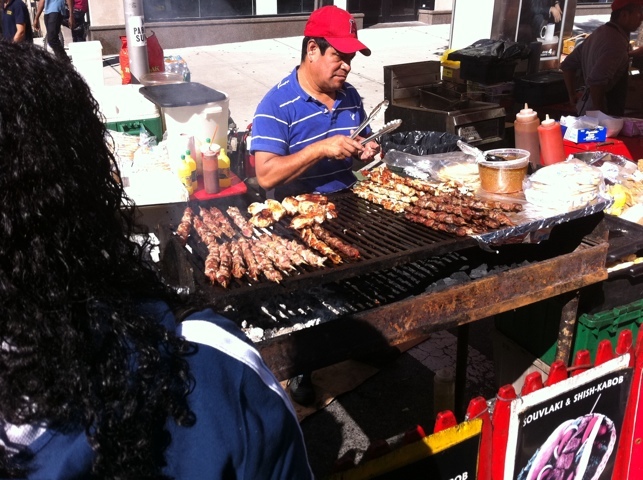 I’ll confess it: I love me some street meat. It’s a guilty pleasure. Meat on a stick. I suppose it must be one of the oldest preparations in existence. Is it competitive as a baseline New York food with hot dogs and pizza? And there’s something somewhat craven and delicious about getting it at these places. Who knows what it is, exactly? Who knows what diseases its carrying? Have the vendors washed their hands? Certainly not. Will I need to sprint to the can? Will it be delicious? Will I bite into a charred glob of pure fat? 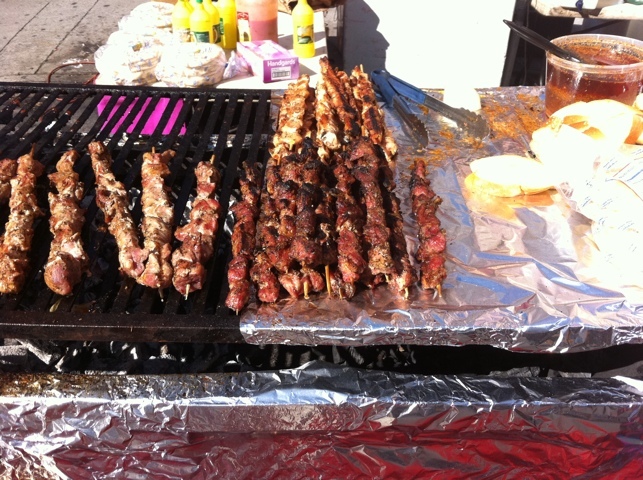 All this and more is part of the “food roulette” of street fair street meat. A pretty good one, this time. This time, the vendor alleged what I was getting was “beef.” It had candied into a dried texture, enlivened by a spritz of a red sauce which might be considered “barbecue” or watered-down ketchup. There was no fat or gristle, just a smoky, chunky texture, a sense of taking my life into my hands, and the sweet, salty, tasty chew of $4 mystery meat. Jesse, you’re a brave man.